Benjamin, sales application engineer, Diane, legal advisor, Gilles, photographer : they are all people with disabilities who have agreed to talk about their backgrounds and their difficulties in finding a job. Each of them was interviewed, revealing their outstanding motivation. There are always prejudices in the way other people see you, and disability is still an obstacle to being hired. It is also very hard to find a job in line with your qualifications… The fight is far from over! Could you introduce yourself, Diane? Despite a fluent level in English and a Master’s degree in Public Law from Paris 11 University, I had trouble finding a job. I began my career giving English lessons at the Paris 13 University Institute of Technology, and took charge of tutorials in law at Paris 10 University for a while, but my situation was not very stable. I then started work at Paris City Hall, where for three years I had a number of jobs that were not directly linked to my education and training (housing, roads, human resources, etc.). At the Ministry of Social Affairs, I finally found a job in a sector that was a little more linked to law. I then got a job as a legal advisor at the ARS (regional health agency) for the Paris region in the inspection of health and social establishments department. Today I am a legal advisor at the CNCP, the National Commission for Professional Certification, where I can make use of my knowledge of law and English. In parallel with my work, I am a member of the “Ressource Handicap” group at the CFDT and I work at a number of associations providing help for disabled people, such as the APF, Handyjoy, FDFA and, of course, LADAPT. What is your connection with LADAPT ? 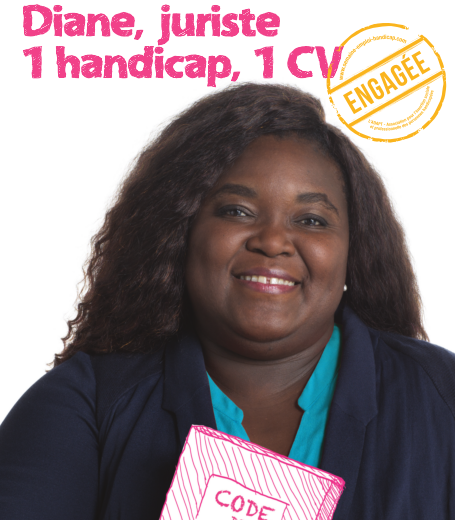 LADAPT helped me find a job by assisting me in writing my CV and cover letter! Éric Blanchet, who was my mentor for one year, helped me to look for a job until I was hired. I had the chance to take a skills assessment in one of the LADAPT establishments. This association helped me regain my self-confidence. Now I do voluntary work for LADAPT. For you, what is an inclusive society? As an ambassador for the past two years for the Week, do you think that employment for disabled people has progressed in recent years ? There has certainly been a lot of progress, but there is still a long way to go: there are more and more laws, more and more subventions for companies, but it takes time for them to be used; loans exist for companies, but they are not well publicised. 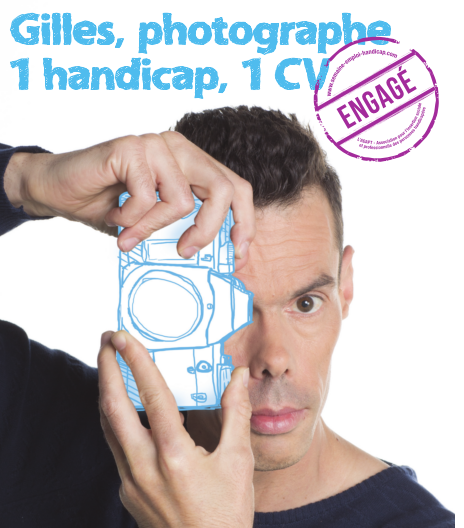 There is still prejudice in the way others look at disabled people, disability is still an obstacle to being hired. It is also very hard to find a job in line with your qualifications… So the fight is far from over! There is still a lot to do to improve everyday life, but regarding public transport, the accessibility to major structures, progress has been made. There are a lot of subventions, and more and more associations that are increasingly visible. The fight is starting to pay off ! Could you introduce yourself, Gilles ? I started my career in sales, then I became a shop manager. After 15 years, I left to work at Canal + where I had a job in telemarketing for 4 years, until 2008, the year I had a stroke and a ruptured aneurysm, which left me paralysed on one side. After 14 months of physiotherapy at LADAPT/Soisy-sur-Seine I fully recuperated. So I went back to Canal+, where I was awarded a DIF (individual training programme) and took a course in photography, which was something I had loved for years. I was trained by a great photographer at the Nikon School in Paris. This enabled me to start off and sell my services on the internet: reports, weddings, portraits, catalogues, etc. Today, I work a lot in sport, and I sell my photos to L’Équipe newspaper, in particular. I run my own business and have my own photo studio. My job leaves me enough time for my many hobbies – I play the guitar, I’m a big fan of cinema and I work out three times a week with a coach ! I first found out about the association in 2008 during my physiotherapy. I have always kept up links with them and whenever I can I get involved in their events. For example, I took part in the inauguration of the LADAPT/Châtillon centre a few years ago. For you, what is an inclusive society ? I think that an inclusive society is one that fights exclusion and conveys the values of equality and sharing, a society without discrimination, where each person has the chance to seize their chance and flourish in the world of work. Today, progress has been made, it took a long time to do it, but it works. When I worked at Canal +, there were, for example, adapted jobs. Ergonomics plays a crucial role, as do the indemnities paid by the state. As an ambassador for the Week for the past two years, do you think that employment for disabled people has progressed in recent years? Absolutely! There is more and more recognition for people with disabilities at work, and accessibility, in the literal and figurative sense. There is still a lot to do to improve everyday life, but in terms of public transport, the accessibility to large structures, progress has been made. There are a lot of subventions, and more and more associations that are increasingly visible. The fight is starting to pay off ! I am fortunate to work for a group that acts and advocates every day for the employment of persons with disabilities. I was hired for my skills and not my disability. Can you introduce yourself, Benjamin ? I obtained my BTS NRC (Negotiation Customer Relations) in June 2012. I prepared myself alternately to become a social insurance broker. After six months of unemployment, I finally got a fix-term contract for 6 months at Malakoff Mederic to manage appointments, and surveys, areas where I have good skills. Then I signed an open ended contract as transverse sales assistant. I now work in a team of 3 salesmen and responsible for appointment, distance selling and marketing. Thanks to these tasks, I had the chance to upgrade quickly my skills within the group Malakoff Mederic. Outside the office, I'm a big sports fan. I practiced rugby for many years and am currently looking for a club for the upcoming season. I was also a volunteer educator rugby school for 1 year. What is your relation with LADAPT ? During the "Week for the Employment of People with Disabilities", LADAPT was looking for people with disabilities who were employed in companies that were partners of the Week, including Malakoff Mederic. I already knew LADAPT because I got my first fix-term contract at Malakoff Mederic after an interview during the Week for the employment of people with disabilities in autumn 2012, via the French employment agency. It seems to me that we already have an inclusive society. When we speak about inclusion in the world of work, there are laws, an obligation for employment, the famous 6 % [of disabled employees out of the total workforce], and the companies that don’t respect the law are penalised. So I think that everything is being done to promote the inclusion of disabled people. I went to school in an ordinary environment, and I always felt I belonged. The same is true for sport, I played rugby for many years alongside able-bodied players. An ordinary environment has the advantage, in my opinion, of opening a disabled person to others, and so represents a positive factor of inclusion. I would say that when you have the willpower, then a disability, even if it may close some doors, allows you to open others. Of course, each situation is unique, and varies according to the degree of disability. As an ambassador for the Week for the past two years, do you think that employment for disabled people has progressed in recent years? Yes, there has been progress, but things still need to be done. The law encourages companies to recruit disabled people. And then there is the European Disability Employment Week, which is an important event. It is a chance to raise awareness among companies so that they can mobilise for employment. I am lucky to work for a group that acts on a daily basis in favour of the employment of disabled people. I was recruited for my skills and not for my disability.